Can I Tumblestack Underglaze Greenware For The Bisque Fire? I have a lot of different items my students made and for the first time I am working with the Velvet Underglazes from Amaco, they are now bonedry, I mean really bonedry! Can I stack underglazed pots in underglazed pots to be bisqued or will they fuse. Would it also fuse on the shelves if some of the underglaze is on the bottom of the pots. To be safe I have cleaned all the bottoms and it was quite tedious. I am ready for the first bisque fire and will post the before and after shortly. You SHOULD be able to bisque un-glazed greenware stacked. Under glazes is a different problem. If you fire below the flux temp of the under-glaze you probably OK. Err on the side of safety. and wipe the bottoms and don't stack them if you are not sure. Maybe stack one or two and try it. If you are new to this, slow down and learn what will work and not work by testing non-critical pieces. Never really had a problem here with that, and underglaze is my whole world. The only thing you wanna watch out for is fuming, which causes color to appear on adjacent ware. I've found underglazes heavy in cobalt or chrome are more prone to it, but it doesn't happen too often. I agree with Guinea you should be able to stack just watch any dark blues especially don't put them next to a light piece as they sometimes fume off and discolor adjacent pieces. I fire underglazed pieces all the time and the dark blues are the only ones I have had issues with. I find that the velvet black underglaze sticks at least at cone 02, possibly lower. I used a lot of velvets with students using a ^06 clay and bisqued at ^04. Sometimes a little sticking but no transfer between work. I usually stacked 2-3 high. Yep, as Guinea said, fuming would be the biggest issue. I'll have students, use underglaze on the bottoms of wares, since I generally don't let them use glaze. We get a bit of color transfer. It usually only shows up, on the bare portions of the ware, that will eventually be glazed, or just on the kiln shelves. I agree that you should watch out for blue fuming ... But wonder if you should also be careful of thickly applied areas not touching. If your students are not experienced they may have been overly generous with application in some areas. With the velvet underglazes it should be no problem. However if velvet is not in the name of the underglaze it will flow and stick. Personaly I think some products are labeled as underglazes which are not truely underglazes as they have frit added to them. An example is Stroke and Coat. dennis, my many bottles of stroke & coat have the meaningless name "wonderglaze" on the front of the label. the descriptions for use vary for different colors. it is not an underglaze as it fires to a gloss finish. i often use small amounts as decorative leaves or flowers on top of a white glaze so that with the cone 6 clay and glaze, the finished product comes out looking like majolica. the individual bottles are labeled with info for cone 6 as an exception to the usual cone 06 they were intended for. many say "cone 6 results no change". i get mine from local "paint your own pottery" places where they are used by customers. I disagree with that statement that unless they are Velvets they will stick. I use Amacos LUG line exclusively and don't have an issue with sticking. Maybe you are meaning others brands than Amaco? I like to use underglaze on greenware, then after firing add an overglaze if I want it shine. Question....having used Duncan products I know that Concepts cannot be applied to greenware. BUT the Mayco Stroke and Coat says it can be applied to greenware. It fires shiny. I am confused. Isn't Stroke and Coat and Concepts basically the same product? I recently took a glazing class and the handouts stated that both Stroke and Coat AND Concepts can be applied to Greenware. TRUE? Good question; I don't use Duncan, nor underglaze greenware - I do use Speedball underglazes on bisque. Any road, I'm curious why you're applying underglaze on greenware? When I use underglaze, it is always on green ware, or the item goes through the bisque firing before the next glaze / underglaze layer is applied. The firing fuses the underglaze and avoids any bleeding or smudging of the designs that the unglaze is supposed to produce. It is frequently used as a background for sgraffito work. I fire at cone 10R. Stroke and Coat underglazes actually function as glazes at cone 10, especially the red version, so we avoid getting that underglaze on the bottoms. I use underglazes on greenware too. I find the pots glaze more evenly when the binders that are in the underglaze burn off in the bisque firing. @T Jeane Williamson, try it and see what happens. I have a few underglazes that flux enough in a 04 bisque to gloss them up which makes it difficult to glaze but if I bisque to 06 instead they don't flux so much the pots absorb the glaze better. 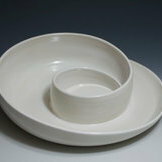 As far as bisque firing most are done slowly in order to effectively burn out any organics as time is very important. The fastest popular commercial bisque schedule I believe I have seen is In the 10-12 hour range. The point is, what works for you and your claybody is most correct after testing of course but very quick bisque schedules are not overly common. If this was an 06 glaze fire, then the fastest Common that I have seen is just over 4 hours. It’s hard to get an accurate cone bend going any faster than 120 degrees an hour in the last 200 degrees or so of the firing. That means at least 1-2 hours for the glaze to mature which leaves little time for the rest of the firing. with respect to stroke and coat, to me it simply is a glaze that melts at 04. We use it as an overglaze and downfire for decoration. My wife uses underglazes extensively and has taken to making her own using Mason stains and propylene glycol. Why? She has significant painting skills and likes the detail as well as being able to see the finished color while she paints. The gem below looks ok when first painted but she believes it can match her skills better if she is able to apply her colors more accurately. Your wife work is lovely. Thank you for posting them. So, to answer your questions....I had hired the electrician to put in a 60 amp breaker and GFI in a box. He put all wires in for a 60 amp breaker and GFI but only put a 50 amp breaker and gfi as he would have ha d to order them and he had the 50. UG! So, yes all the wiring is for 60 amps. I was NOT happy when I discovered that he put in a 50 when I had ordered a 60. But that is fixed now. I was able to lift the lid of the kiln and the witness cone is bent down quite a ways...not to the ground but about half way. The pieces inside appear to be glazed...as expected. Could it be that my kiln is just running too hot...thus finishing in 3 hours? Yes, for a glaze fire with a typical commercial controller set on fast glaze the entire cycle will be less than five hours. The last 200-250 degrees of the firing will be at a rate of 100-120 degrees per hour. Most of the heatwork is done during this period. Cones are made of glaze, literally. To get them to bend at their chart temperature the last 200-250 degrees need to be heated no faster than 100-120 degrees per hour. For folks firing to cone six, their kilns probably cannot go much faster at the high temperature due to how much power they have available. For lowfire folks, this is quite different as their kilns May still be able to go 300 degrees per hour at cone 06. I would definitely slow the firing down. If you look at the cone chart below there are three columns, 27 degree per hour, 108, and 270. These cones will bend at their assigned temperatures (remember they are made of glaze) if the last 200-250 degrees of the firing is at those speeds. folks always quote heatwork, but clearly not all heatwork is relevant. If I try and toast a piece of bread it will not matter how long It is left at 120 degrees, it just will not toast. Now, 500-800 degrees for one minute and we probably get light brown toast. yes I would slow this down and dial in a perfect melt schedule for yourself . Three hours is likely too fast. And yes thank you she has portrait artist brush Skills! When I use underglaze, it is always on green ware, or the item goes through the bisque firing before the next glaze / underglaze layer is applied. The firing fuses the underglaze and avoids any bleeding or smudging of the designs that the unglaze is supposed to produce. Not necessarily. It depends on the underglaze and the glaze. I apply my underglazes to greenware, and my glazes will still pick them up and bleed them. I can adjust the fluidity of my glaze to control how much they bleed. I like the black lines of my mishima work to bleed out a little bit. What works for one potter might not work for another. Different clay, different water, different climate, different kiln. Different.